We took our popular Compact Sling Bag and made it better yet. We call it the Stage II. 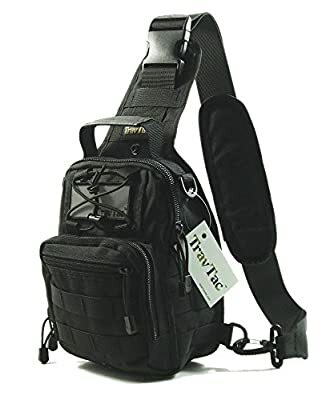 Our TravTac Tactical Shoulder Pack is the Perfect Compact Solution for Organizing and Carrying your Gear. The Small, Versatile Military Style Tactical Backpack Design is Heavy on Utility. Can be used as a Shoulder Bag, Chest Pouch, Back Pouch or just Hand Carry it. A generous number of dividers and pockets give this one strap Backpack endless configurations. Interior Main Compartment: You can fit a 3"L X 6.5"W X 7"H box in the bottom of the compartment, above 7" it starts to taper off to 2"L X 5.5"W at the final 10"H.
NOTE: A standard size iPad, iPad Pro or iPad Air will NOT fit in this bag. An iPad mini or similar size tablet fit fine. Please review dimensions and pictures to confirm it fits your needs. Order yours today and discover more uses for your TravTac bag! PLEASE READ (check dimensions in pictures carefully): A Superior Tactical MOLLE Style Sling Bag - Small Compact Design for EDC (Everyday carry). Goes Anywhere Design is Perfect Where Large Packs are Too Big, Too Bulky and Too Heavy. Ambidextrous and Configurable 3 ways (Shoulder Pack, Chest or Back Sling and Hand Carry) Padded Shoulder Strap Provides All Day Comfort. Permanent Zipper Pulls won't Loosen or Fall Out like Knotted Pulls can. This MOLLE Compatible Pouch has 3 Zippered Compartments and Contains Multiple Dividers for Easy Organization of Gear. Ruggedly Constructed from Premium Materials and Upgraded 900D Fabric. Ideal for both Indoor and Outdoor use including Hiking, Hunting, Travel, Camping, School Supplies, Biking, Sporting Events, Gear / Tool Bag, Range Bag Etc. Highly Reflective Safety Patch Adds Night Time Visibility. Patch is Velcro Backed making it Removable for Trail Marking or Rescue Signaling. Thickly Padded Back Pocket is well suited for Concealed Carry and Shoulder Strap is Detachable and Adjustable in Length. Genuine TravTac Products are Sold Exclusively by Trusted Empire and are Quality Inspected, Packaged and Shipped from the USA.